Kennel Cough is a broad term covering any infectious or contagious condition of dogs where coughing is one of the major clinical signs. It is also referred to as infectious tracheobronchitis. The termtracheobronchitis describes the location of the infection in the trachea or "windpipe" and bronchial tubes. "Several viruses and bacteria can cause kennel cough, often at the same time." 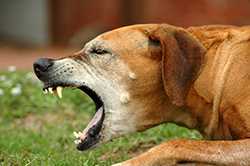 Several viruses and bacteria can cause kennel cough, often at the same time. These include adenovirus type-2 (distinct from the adenovirus type 1 that causes infectious hepatitis), parainfluenza virus, and the bacterium Bordetella bronchiseptica. Because the infection spreads when dogs are housed together, it is often seen soon after dogs have been in kennels, hence the name "kennel cough." What are the clinical signs of kennel cough other than coughing? Clinical signs may be variable. It is often a mild disease, but the cough may be chronic, lasting for several weeks in some cases. Common clinical signs include a loud cough often describe as a "goose honk", runny eyes and nose, swollen tonsils, wheezing, lack of appetite and depressed behavior.Most dogs with infectious tracheobronchitis will cough when the throat is rubbed or palpated. Often, the hacking cough caused by kennel cough will persist for several weeks after the infection. How does a dog get kennel cough? Kennel cough is very contagious, and dogs can readily transmit it by casual contact such as sniffing each other when on a walk, playing or sharing water dishes. What is the treatment for infectious tracheobronchitis? There is no specific treatment for the viral infections, but many of the more severe signs are due to bacterial involvement, particularly Bordetella bronchiseptica. Antibiotics are useful against this bacterium. "...most infections resolve within one to three weeks." Some cases require prolonged treatment, but most infections resolve within one to three weeks. Mild clinical signs may linger for several weeks even when the bacteria have been eliminated. Cough suppressants and anti-inflammatory medications may provide relief in some cases. How can I prevent my dog contracting Kennel Cough? Most vaccination programs your veterinarian will recommend include adenovirus and parainfluenza.Bordetella vaccination is also highly recommended for dogs that are boarded, groomed or interact with other dogs in areas such as dog parks. How effective are these vaccines? "Immunity, even if the dog has experienced a natural infection, is neither solid nor long-lasting." Immunity, even if the dog has experienced a natural infection, is neither solid nor long-lasting. We cannot expect vaccines to do much better. Since immunity varies with the circumstances, consult with your veterinarian regarding specific vaccination recommendations for your pet. Some kennel facilities require a booster vaccination shortly before boarding and some veterinarians recommend a booster vaccine every six months to ensure maximum protection against this troublesome infection. How are the Bordetella vaccines administered? Bordetella vaccination is given either by injection or intra-nasal route. Intra-nasal refers to the liquid vaccine administered as nose drops. This allows local immunity to develop on the mucous membranes of the nose, throat and windpipe where the infectious agents first attack and provides more rapid protection against infection than the injectable vaccine.